I have no idea how I got this figure. There were two versions of Gollum made: one with a calm face, and one with an angry face. The angry Gollum was sold in a two-pack with Sam Gamgee, while the calm one came in a Toys Я Us-exclusive box set, along with Frodo, Gandalf, and a hidden Uruk-hai Berserker. While I have Gandalf and the Berserker, I don't have a Frodo; and I do have the other figures that came with Gandalf and the Berserker, so I clearly bought those in two-packs, not the box set. So where did Gollum come from? 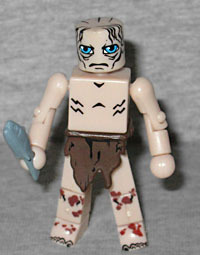 Built on the standard 2" Minimate body, Gollum is a pale pinkish-gray. His knees and feet are painted with splotches of mud, and he wears a tattered brown loincloth. His eyes are huge, and there's stringy hair painted all around his head - even on top! There are big scars criss-crossing his back, and beneath those is his curving spine. Poor gross little guy! He gets an accessory, too: a little blue fish. Since the LotR Minimates came out at the same time Art Asylum was doing the C3 thing, they have Lego-stud-sized holes in their feet, and they all came with clear flat bricks to use as display stands. Like most Minimates, they move at the same 14 points: neck, waist, shoulders, elbows, wrists, hips, knees and ankles. That's a heckuva lot of motion for something so tiny. This entry was posted in Art Asylum, MMMR and tagged LotR, Minimates. Bookmark the permalink.